Pear is sweet and succulent fruit. In India, pears do not get much popularity as there should be. It has many health benefits. There are many nutrients found which cures blood pressure, cancer, diabetes, skin and stomach related diseases. 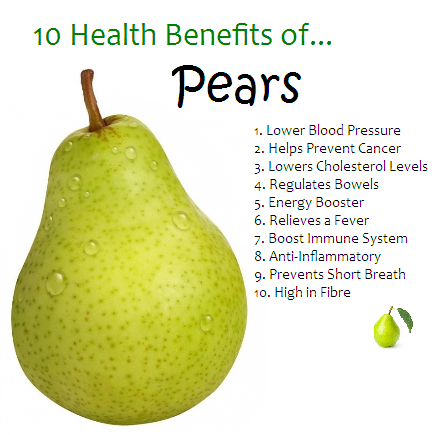 Strengthen the Digestive System: Pears are a good source of fiber that strengthens the digestive system. It contains pectin which fixes constipation and diarrhea. You must have to drink juice every night. Prevents from Anemia: Pear is a good source of iron which increases hemoglobin level and provides protection to anemia patients. Healing of Cholesterol: Pear contains pectin which reduces cholesterol. Everyone should drink the juice. Heals Fever: A glass of pear juice get relief in fever. It gives cold to the body. Increase Immune System: Pears contains anti-oxidants and vitamin C which boost the immune system and helps to fight against colds, flu and infection. Prevents Cancer: It has copper and vitamin C which damage the free radicals which creates cancer. Increase Energy: Pear juice increase the energy quickly in the body. It happens because it contains glucose. Reduce Inflammation: People who get inflammation and pain they can get relief from pear juice. Beneficial for Bones: Pear contains high amount of boron. Boron helps retain calcium in the bones. Therefore, the risk of osteoporosis reduces by eating pear. Control High BP: Pear contains potassium and glutathione which are a type of antioxidants. It reduces blood pressure, risk of heart attacks and strokes. Diabetes: Pear is very good for diabetics as it has high amount of fiber. Blood slowly absorbs sugar and fiber controls its level.